A steak is the perfect dish, be it a one-time snack or the main course. 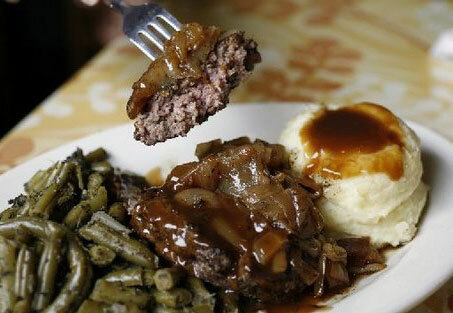 Amongst the various preparations of a steak, there is no match for a Salisbury steak! This steak, which gets its name from an American physician Dr. J.H. Salisbury, is one of the most popular dishes in the U.S. since the early 19th century. Usually it is served along with mashed potatoes and gravy or with noodles. The preparation method is similar to that of a hamburger steak; it is the ingredients that differ. Take some cooking spray and spray on a medium sized baking dish and keep aside. In a separate bowl, mix the above mentioned quantities of beef, water and dry stuffing. Add onions according to your liking. Mix again. Take out some of the mixture we made above and shape them into equal sized patties. Arrange these in the medium sized baking dish we had prepared earlier. Cook in the oven for approx 25 minutes at 375 degrees. Now we pay our attention to the mushrooms. The sliced mushrooms should be mixed along with the can of gravy till we have the mushrooms evenly covered with gravy. After the patties have been inside for around 25 minutes, we have to remove the dish and cover it with the gravy mixture we prepared. After pouring the gravy mixture evenly over the patties, they should be set back inside the oven for another 10-15 minutes. The best way to check is by seeing that the steak is not pink from inside. Pink means that the meat is not cooked properly. Another generic way to check for meat is to take a meat thermometer and ensure that the temperature inside the meat is at least 165 degrees. This ensures that the meat has been cooked properly and you and your family are safe. Once the above is done, take out and server with your favourite garnishing! Gravy can be cooked on your own, if you prefer to do so. The gravy can be added later if you want to do so. You just have to make sure that mushrooms spend some time in the gravy so that they become soft.